A hologram-like glowy 3D display. Inspired by those 2D displays based on spinning LEDs that show simple lines of text, we imagined that multiple layers of spinning LEDs could be used to create 3D objects. The result is our volumetric display: a display capable of showing a variety of shapes in 3D space. The machine consists of 40 LEDs all soldered to a few bread boards with shift registers on them, and all of the shift registers connect to an arduino, thereby allowing the arduino to fully control all of the LEDs. 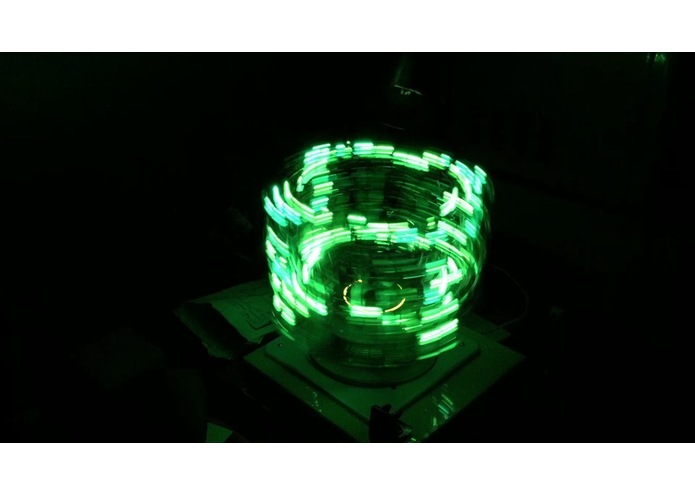 The arduino and the LEDs sit on a rotating platform that we made from laser cut acrylic. 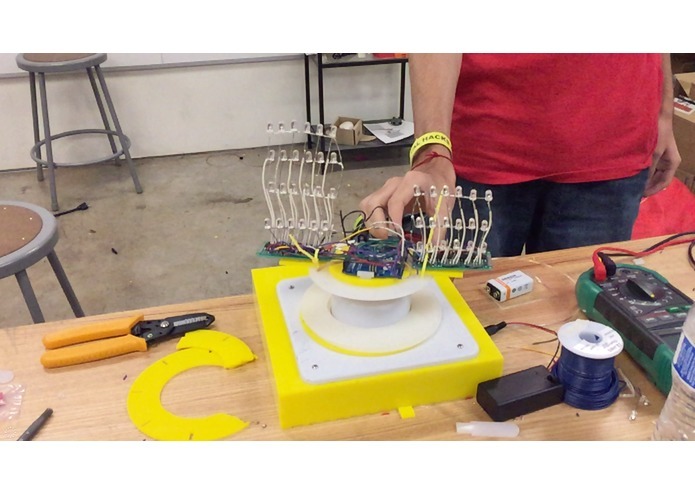 The arduino blinks the LEDs in time with the rotation of the platform in order to produce 3D objects. Over the course of the project we encountered many difficulties including producing literally hundreds of solder joints, attempting to stabilize a platform that would wobble and rip itself apart when spinning, and syncing the arduino as best as we could to the speed of the motor (while the speed of the motor changed due to draining its battery). However, we succeeded in producing the device which can indeed produce 3D objects and have a demonstration program that produces the outlines of a cube. I mostly worked on the engineering and construction of the machine. I designed pieces to be laser cut and built the housing, mounted the motors, and reworked my designs to reduce the wobbling of the LEDs as he machine spins.